a light called artichoke. | owl's house london. Perhaps the two most distinctive, the wonderfully named Artichoke and the rather more dry PH5 were both designed in 1958 by Dane Poul Henningsen. 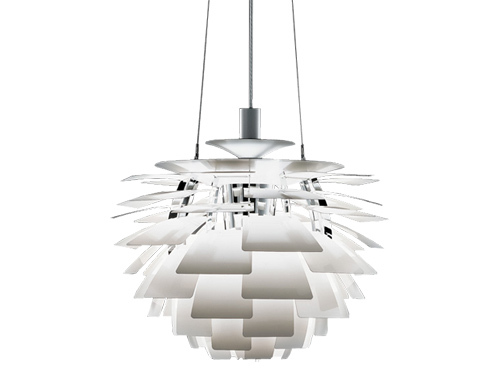 He was an architect and critic, but his main focus was lighting and he collaborated with Louis Poulsen over his career. He designed not just aesthetically, but scientifically, using refraction to create soft, glare-free lighting. He grew up with petroleum lamps, and, with the advent of harsh electrical lighting in the 1920s, his objective turned to creating an ambient, warm glow rather than to ‘flood the home with light’. His first design was a three sided lamp of brass and opal glass, exhibited in the Danish Pavillion at the Paris Exposition of Decorative Arts in 1924. It was picked up by his peers and used internationally by amongst others, Mies van der Rohe in his Villa Tugendhat. The first PH lamp. The PH Artichoke is characterised by 72 leaves forming 12 rows of 6 leaves each, which are positioned to provide 360 degree glare-free light when viewed from any angle. They also shield the light source, redirecting and reflecting the light onto the underlying leaves. The result is a luminous glow. The PH5 was developed as a response to constant changes to the shape and size of incandescent bulbs by bulb manufacturers of the time. The light produced is also glare-free regardless of where it is positioned, the multiple concentric shades emitting the light both downward and laterally. A version designed for use with energy saving lamps was introduced in 1994, and the PH50, in high gloss colours for the 50th anniversary. Photographed by Jacob Termansen. Images Elle Decor. Two very distinctive designs, one designer. What do you think? Unique and individual, or ubiquitous and much-copied? This entry was posted in design heros. and tagged Danish design, design, lighting, Louis Poulsen, modern on November 22, 2012 by owls house london..
Pingback: simple luxe in stockholm. | owl's house london. Pingback: sorrento simplicity. | owl's house london.